The curtain drops on the 2014 NFL campaign as the season has reached Week 17. As the playoffs approach, there’s nothing but division tilts are featured on the NFL Confidence Pool Week 17 sheet. This is your final chance to win some prizes or save your season with the NFL Confidence Pool Week 17 sheet. It’s also your last chance to pick some winners with the Week 17 Pick Em sheet. As always, both sheets can be downloaded and printed instantly for free courtesy of PrintableBrackets.net. In an effort to make games more meaningful and less like exhibitions or playoff tune-ups, the NFL decided in 2010 that all games in the final week of the regular season would feature division opponents against one another. In addition, the NFL leaves the prized “Sunday Night Football” slot vacant until the final week of the year. The game that has the biggest playoff implications is later moved into the slot in the days leading up the final day of the season. There is no “Monday Night Football” game in Week 17. Traditional and long-standing rivalries will be renewed on the NFL Confidence Pool Week 17 sheet. In the NFC North, the Green Bay Packers will clash with the Detroit Lions, while the Chicago Bears will be at the Minnesota Vikings. In the NFC East, the New York Giants will host the Philadelphia Eagles, and the Washington Redskins will host the Dallas Cowboys. 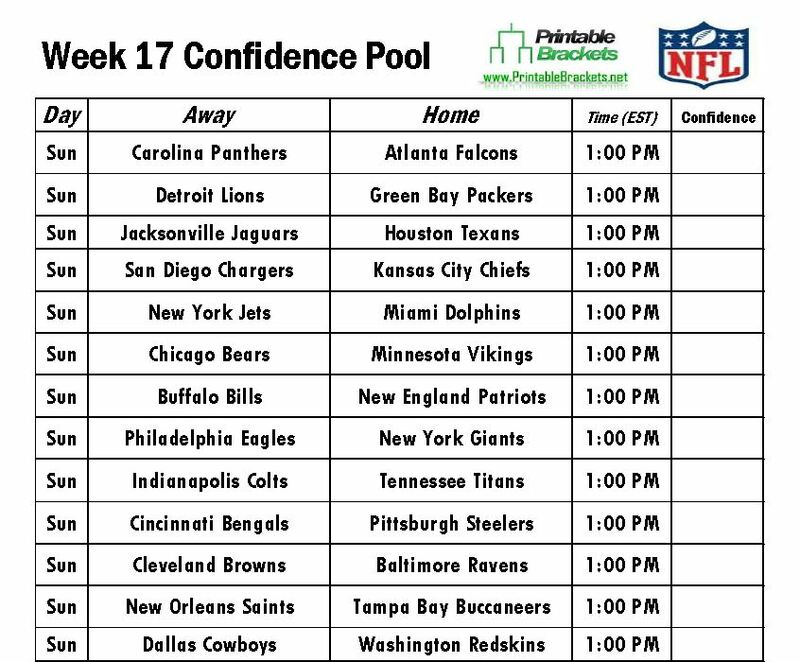 There are only three late Sunday afternoon games tentatively scheduled on the NFL Confidence Pool Week 16 sheet. All four teams in the NFC West will be in late action as San Francisco will be at Arizona, and St. Louis will be at Seattle. Also late Sunday, the Denver Broncos will be at the Oakland Raiders.